It’s the year 1951. King George VI is on the throne, the Festival of Britain has opened, zebra crossings are appearing for the first time, and the first ever episode of The Archers has aired on the wireless. And in the then Hampshire village of Fareham, Mrs Kathleen Ahearn arranged for her septic tank to be emptied by a small local firm called the Hampshire Cleansing Service. More than 66 years later, the company has grown into one of the biggest independent waste management organisations in the UK and is now known as CSG. 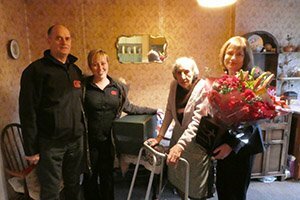 But one thing hasn’t changed over that time – Mrs Ahearn, who celebrates her 100th birthday this year, is still a customer! “The company is more than 80 years old and we have a number of customers who have used our off-mains drainage emptying service for very many years, but we think Mrs Ahearn has probably been with us for longer than anybody else,” said Dave Gailor, Group Operations Manager. To celebrate a remarkable example of customer loyalty, members of CSG’s staff arranged a thank you presentation at Mrs Ahearn’s home where she was presented with a bouquet of flowers, a hamper – and, of course, a free septic tank collection!Joining their customer for the presentation was sales executive Michaela Forder, CSG regional business manager Hayley Northway, driver Richard Bramley from the company’s Botley depot who has been maintaining Mrs Ahearn’s septic tank for the past 18 years, and Peter Chiodo from CSG’s marketing team. Picture shows: Mrs Ahearn receiving her gifts from (left to right) Richard Bramley, Hayley Northway and Michaela Forder. · PICTURE SHOWS Mrs Ahearn receiving her gifts from (left to right) Richard Bramley, (others to be added}.